Poland suffered a surprise 14-15 defeat at home to Croatia in Division 2B of the European Nations Cup (ENC) on 27 October, which also sees them drop four places to 35th place in the latest IRB World Rankings. 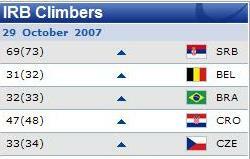 Despite their first defeat in this edition of the ENC Poland remain favourites to be promoted to Division 2A in 2008. Croatia move up one place to 47th in the rankings and maintain their faint hopes of overhauling Poland at the top of Division 2B. Serbia move up four places in the rankings to 69th following their 17-17 draw with Denmark away at the Odense Atheltics Stadium in Division 3A. Denmark drop two places to 58th. Lithuania maintained their 100% record in Division 3B with a 64-3 victory over Bulgaria in Vilnius. Hungary kept up the pressure on Lithuania at the top with a hardfought 5-3 win over Norway in Szekesfehervar. They move above Senegal into 67th in the rankings and lie two points behind Lithuania in the Division 3B standings. The sides meet on the 25 May 2008 in a match that looks likely to decide who gets promoted to Division 3A. Slovenia stay top of Division 3C after a 32-3 win over Finland in Ljubljana. Luxembourg defeated Bosnia & Herzegovina 30-3 to remain just two points behind Slovenia with the two sides meeting in the next Division 3C match on 19 April 2008. Neither result affected the IRB World Rankings. The ENC continues with two more matches on 3 November - Spain play the Czech Republic in Madrid and Sweden face Denmark in Helsingborg.